Had the opportunity to run a trip with a great fellow charter captain, Capt. Calvin Duvalle. We had a bachelor party group that was hungry for some trout and redfish action. The fish did not disappoint. We headed out deep into the Biloxi Marsh to get on some hot trout and redfish action. The hot ticket today was the High Water Lures Cork with either Campo’s Marina Live Shrimp or Vudu Tiger Shrimp. The difference maker in the bite was adding the red Crappie Physic trailer, the bite was actually harder with the trailer on. 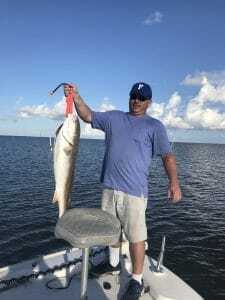 Great thanks to Duvalle Cajun Charters for letting me help out.